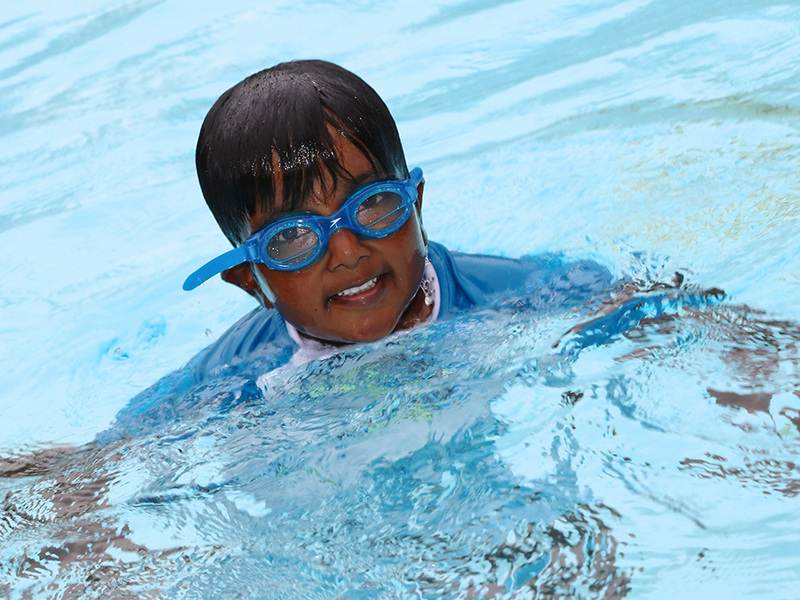 We offer Pre-competitive swim clinics for children as young as 4 years old! Our Pre-competitive program will add skills needed for competition including diving off of starting blocks. This class is meant for our swimmers that want to prepare to join a swim team at a very young age. Most classes have a swimmer to instructor ratio of 3:1, but we also offer 2:1 and 1:1 classes. For a detailed list of skills and more thorough description of each level, tap on each link to read more below. This curriculum is designed for swimmers who have a basic knowledge of freestyle and backstroke and are working to learn breaststroke and butterfly kicks. Our goal is that swimmers can move from a level 3 program to this pre-clinic at a very young age because they desire to learn the skills needed to join a competitive aquatics or swim team program. We prepare our swimmers to know the proper way to swim all 4 competitive strokes, as well as how to save themselves in an aquatic emergency. The stroke technique curriculum learned in level 3, 4, 5, and our pre-clinic program are all the identical in the stroke technique taught for the 4 strokes. The biggest difference in our Learn to swim program vs our Pre-competitive program is that our Pre-competitive program will add skills needed for competition including diving off of starting blocks. This class is meant for our swimmers that want to prepare to join a swim team at a very young age. This curriculum is designed for swimmers who have a basic knowledge of freestyle and backstroke and are working to learn breaststroke and butterfly kicks. Our goal is that swimmers can move from a level 4 program to these Pre-comp Clinics because they desire to learn the skills needed to join a competitive aquatics or swim team program. We prepare our swimmers to know the proper way to swim all 4 competitive strokes, as well as how to save themselves in an aquatic emergency. The stroke technique curriculum learned in level 4, 5, and our Pre-comp clinic program are all identical in the stroke technique taught for the 4 strokes. The biggest difference in our Learn to swim program vs our Pre-competitive program is that our Pre-competitive program will add skills needed for competition including diving off of starting blocks. This class is meant for our swimmers that want to prepare to join a swim team. The difference in our Pre-comp 1 vs Pre-comp 2 clinic is age, maturity, and ability to swim all four strokes legally. Our focus in this program will be introducing the scientific terms that apply to swimming such as buoyancy, propulsion, and body position in such a way that promotes greater speed and efficiency in the pool.